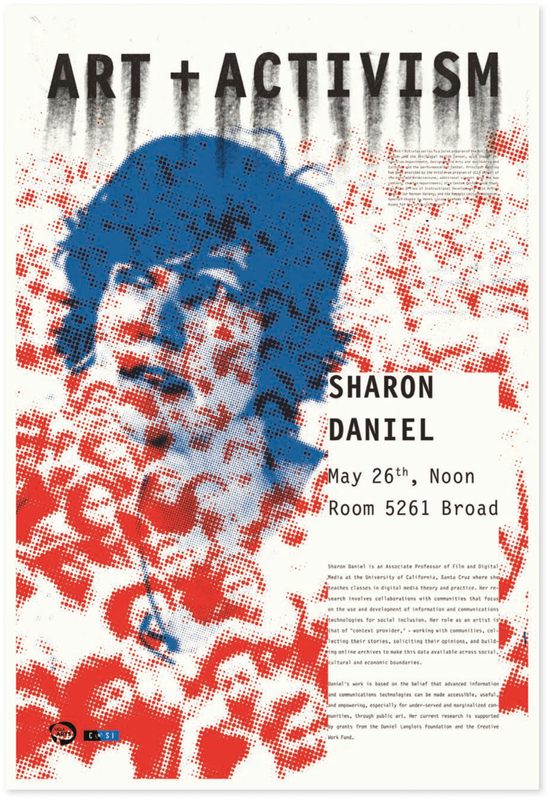 Sharon Daniel is an Associate Professor of Film and Digital Media at the University of California, Santa Cruz where she teaches classes in digital media theory and practice. Her research involves collaborations with communities that focus on the use and development of information and communications technologies for social inclusion. Her role as an artist is that of “context provider” - working with communities, collecting their stories, soliciting their opinions, and building online archives to make this data available across social, cultural and economic boundaries. Daniel’s work is based on the belief that advanced information and communications technologies can be made accessible, useful, and empowering, especially for under-served and marginalized communities, through public art. Her current research is supported by grants from the Daniel Langlois Foundation and the Creative Work Fund.